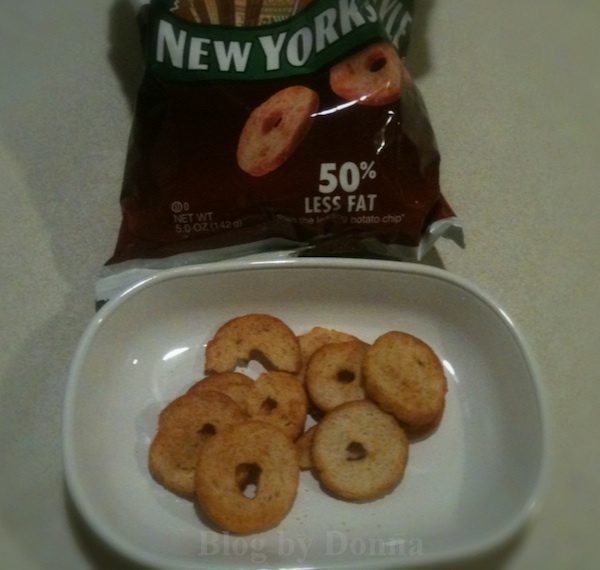 I recently received a bag of New York Style Bagel Crisps in Roasted Garlic, and a bag of Mini Bagels in BBQ flavor. Yummy! We really enjoyed them. I was more fond of the Mini Bagels, which have a really delicious BBQ flavor. My husband loves the original Bagel Crisps, especially when I put a little pizza sauce and mozzarella cheese on them and broil them for a minute. A quick, easy, and tasty snack or appetizer. You can eat them with your favorite cheeses either cold or heated up in the oven to slightly melt the cheese for an anytime snack. Besides the pizza bagel snacks above, we also like them with provolone cheese. New York Style BBQ Mini Bagels are yummy all by themselves! And I bet the BBQ Mini Bagels would make a great crust for pork or chicken. I’ll have to crush some up and try them the next bag I buy. We just ate ours plain, this go round. But I can see having guests over to try my new BBQ Bagel encrusted chicken. Starting off with our mini pizza Roasted Garlic Bagel appetizers. Another way to be a big hit with your family and friends this summer is to enter the Bagel Snack Style Sweepstakes. One winner will have the chance to win a private VIP photographed and catered experience at their local movie theater. New York Style will rent out the theater for you to host the ultimate experience with 50 friends. The winner will also receive a gift card for a year supply ($500 worth) of movie tickets. I would LOVE to win this! 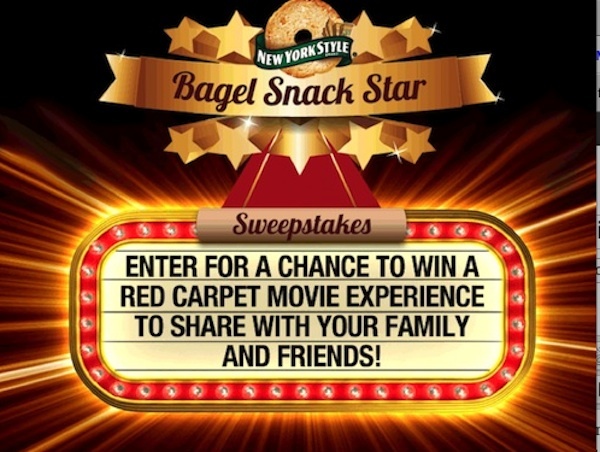 If you would too, enter the Bagel Snack Style Sweepstakes for your chance! You can like and follow New York Style on Facebook and Twitter. Disclosure: I wrote this review while participating in a campaign by Mom Central Consulting on behalf of New York Style and received a product sample to facilitate my review and a promotional item to thank me for participating. Opinions are 100% my own. I know! I’d love to win movie tickets for a year! We love bagel crisps. Never thought of making little pizzas out of them though! Looks like a great snack! Mmmmm, they look very tasty! We enjoyed the New York Style Bagel Crips too! I like both of the flavors that I tried and love your idea of adding pizza sauce and cheese! Oh I love your pizza snacks what a great idea! What a great idea, although I don’t know if there’s be any left to make into pizza (I love them right out of the bag). 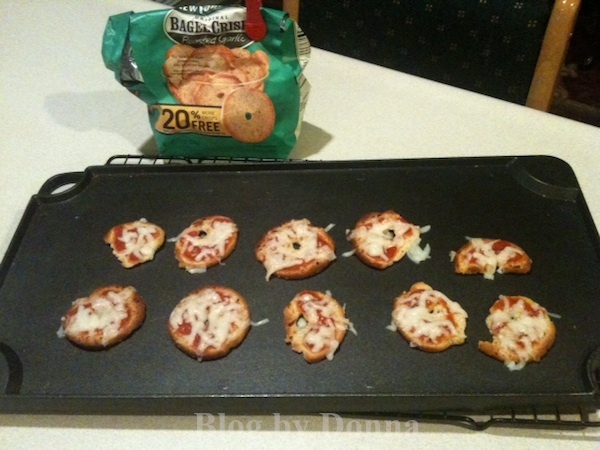 I love your idea of making the bagel chips into mini pizzas. I would also have a blast winning a movie theater party! Love your ideas with these fun treats! My tot would love the pizza bagels! Well that was a neat way to eat them. Never would have thought to make mini pizzas. Going to try that soon.